Beautiful and Newer! 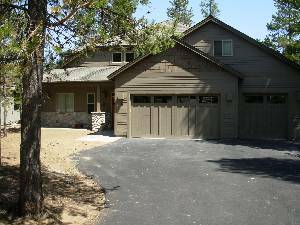 This large Lodge Style, vacation home offers spectacular VIEWS of the second Fairway of the WOODLANDS GOLF COURSE in Sunriver, Oregon! 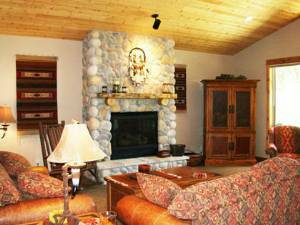 Welcome to the "Woodlands Lodge". This Brand New Beautiful Lodge Style home offers 6 bedrooms with 5.5 baths - five of which are master suites. This spacious home will comfortably sleep 16. This 3800+ square foot home is built with the utmost quality and workmanship and designed to capture the views of the second fairway of the North Woodlands Golf Course. Enjoy the unobstructed Golf Course views from the spacious open floor plan. 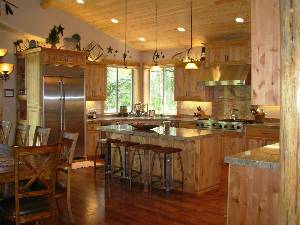 The Great Room, Dining Room and Fabulous Kitchen (complete with a wet bar and wine fridge) offer soaring wood ceilings accented with logs, natural wood, granite and slate. This home allows for space to spread out. Preparing meals will be a treat in the beautiful and well equipped kitchen where you will find double ovens, a six burner cook top stove with a built in griddle, two dishwashers and every gadget and serving ware necessary to prepare any meal or to entertain with during your stay. The pantry is well stocked with all the extras for you to use during your stay. Each Bedroom has designer Linens and plush large towels to help make your stay as comfortable as possible. The Theater room is a great escape for anyone with theater style seating, a mini kitchen and a 42” HDTV. Even though you’re on vacation it is sometimes important to stay connected to home or work. We offer High Speed wireless internet and if you don’t bring your lap top from home, you are welcome to use the computer at the house. Enjoy the outdoors where you will find a private patio with a natural gas BBQ and plenty of seating room for entertaining on the stone paved patio complete and a wonderful relaxing Private Hot Tub. In the garage you will find 10 bikes (one is a tandem) and helmets for use on the many miles of bike paths, a ping pong table and an extra fridge for overflow food and beverages. If you choose to stay at our home you will find that we do not just provide a starter supply of paper products or plastic garbage sacks, we make sure that you have plenty of these items to get you through your stay........you are a guest at our home so why should you have to bring the little things that most homes should already have. Swimming and tennis passes, plump bedding and extra plump towels, porta crib, high chair, Extra Fridge in Garage, X-box plus controllers and games, board games, variety of CD's & videos-DVD's, crock pot, coffee maker, waffle iron, ping pong table, basketball hoop, 10 adult bikes & 2 childrens bikes, 8 Tv's and 3 VCR's, 5 DVD players and popular floorplan and loaded with all the extra's. 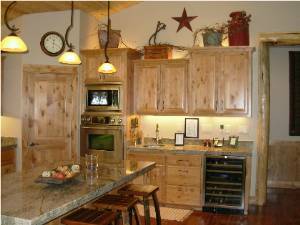 Preparing Meals will be a treat in this well stocked and spacious Kitchen. 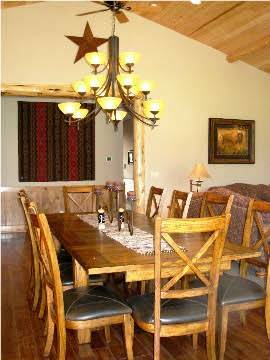 Spacious Open Floorplan - Dining Room Table seats 12 with 4 more at the eating bar. 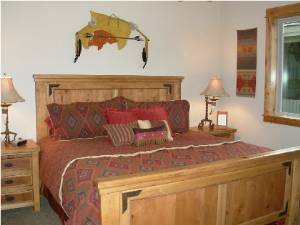 The Native American Suite offers a King Bed and Private Bath. Plump Designer Bedding and Extra Large Plush Towels thoughout. 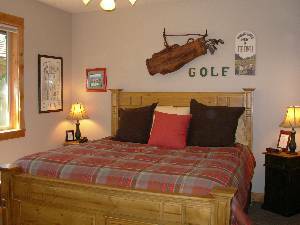 The Golfing Suite offers a King Bed and Private Bath. Three King Masters on the Main floor with great seperation. An extraordinary, exquisite home!!! It is beautifully appointed and utterly completely stocked with every imaginable amenities one could wish for; from bikes with helmets, to X-Box complete with games to plasma TVs in every room to a home theater with DVDs and popcorn to a fully stocked kitchen with two dishwashers (spices and almost every conceivable gadgets needed included) to a stocked wine cellar to a hot tub to two washers and two dryers to Ralph Lauren towels down to ibuprofen in each bathroom. Every detail has been thought of for your stay in this house. We loved our stay so much that our two families have already reserved another week for next summer. Your place was fantastic. 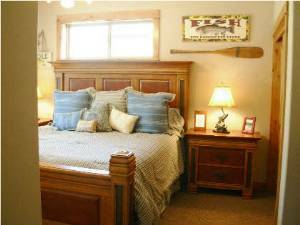 It was ideal for a four family group and the 5 kids loved being together in the same room. It was unlike any other rental we've stayed at, literally everything we could ever need was there and not just "two of them then go buy your own." I would and will recommend it to anyone who ever asks and would not hesitate to stay there again. We have been to Sunriver 4 years now and your place was easily the best place we have ever stayed at. Thank you for sharing it with us. Deposit: 25% Down within 10 days of verbal confirmation. Cancellations and Refunds: Inquire for details. Other Fees: $350 refundable security deposit.